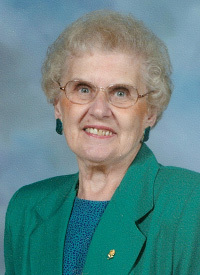 The First Catholic Slovak Ladies Association is proud to announce the selection of Bernadette Robertson from Lorain, OH as our association's 2011 Fraternalist of the Year. Her profile has been sent to the American Fraternal Alliance to be considered for national recognition. The 2011 American Fraternal Alliance's Fraternalist of the Year Award will be announced and honored at the 125th Annual Meeting to be held in Denver, CO in September. Bernadette and her husband, Albert, a Marine Veteran have been married for 56 years. They have four children, one son Edward who lives in Los Angeles, CA and three daughters, Ellen, Karen and Janet who live in the Lorain, OH area. She also has three grandchildren, Michael, Mitchell and Emily. She has two brothers, Rev. Edward J. Luca, J.C.D. of the Cleveland diocese and Raymond of Springfield, VA and a sister Marceline who lives in Lorain. Bernadette is a very compassionate caregiver to her 15 year old grandson, Mitchell, who is autistic and nonverbal. Bernadette is President of S-114 and J-198. She has served in these positions for 12 years and previously served as Vice President for 11 years. She tries to bring awareness of our Slovak heritage to all her members. Bernadette organizes many fraternal activities for the benefit of her members. She has participated in many of our association sponsored contests and challenges. She has encouraged her branch members to become involved in all FCSLA activities. Bernadette serves on the Board of Directors of the American Slovak Club. She is an active member of the United Slovak Societies, FCSU and The Democratic Women's Club. She has been a poll worker for 40 years. Bernadette has served close to 19 years as a volunteer at Mercy Regional Center Hospital's Thrift Shop. She was awarded a special 15 year pin for her dedicated service of more than 1,000 hours. All Thrift Shop profits are donated to the hospital. Bernadette easily draws people of all generations to her with her ready smile and listening ear. She encourages members in her family, church, and societies to become active. She also encourages them and allows them to take charge for the experience they will need to one day take over her many responsibilities. She devotes time to help in her new parish community, Church of St. Peter where she volunteers as a member of the Seniors Group and the Holy Name Society. She had been a member of her former parish, Holy Trinity Slovak Church for 79 years until it closed. Bernadette belongs to the Mar-Win Club, a group of ladies that was formed in her high school days. These ladies have met for over 60 years and support each other through their lasting friendships that have stood the test of time. FCSLA congratulates Bernadette Robertson for receiving this well deserved recognition. She is a wonderful example of our "fraternal spirit" as she continues to make a difference in her family, the FCSLA, church and community. We are very proud to have Bernadette represent us as our "2011 Fraternalist of the Year."